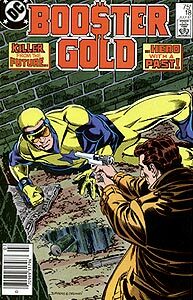 Cover Description: Booster Gold lies on his side in a dirty alleyway as he stares down the barrel of the futuristic pistol aimed at him by Broderick. Brief Synopsis: Booster must save a liquor store owner from robbers while saving himself from Broderick, a cop from the future carrying a grudge. Issue Notes: Booster's hair is slightly longer than the previous issue, but is consistent with the length shown in the Justice League Annual #1. 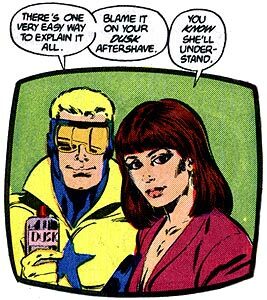 While Booster exercises on a pommel horse, Skeets mentions that Booster was a former professional athlete. This suggests that the rules will change somewhat in the future of college football. It has previously been established that Booster never played in a professional football league, but that does not meant that he may not have been materially compensated in some way for playing for a college team. POWER DOWN: Dirk mentions that Booster must keep in shape for his upcoming Booster Gold calendar shoot. Broderick reveals that he used the Borsten Time Platform to follow Booster into the present following the events of Booster Gold, Vol. 1, #15. How this was possible after Broderick's assassination of Animal remains unclear. In any event, the Time Platform malfunctioned again and delivered Broderick to a time and destination other than the one intended. Broderick reveals that he once though highly of Booster as an athlete whom he hoped would be drafted by the Metropolis Panthers. He praises the government for reviving football "50 years ago" relative to Broderick, or approximately the absolute year 2610. Broderick, a federal agent, reveals that he also a gambled on football, though he did have any influence over the outcome of the games. Sports gambling will apparently be as popular in the future as it is now. PRODUCT PLACEMENT: Broderick watches Booster on a television commercial for Dusk aftershave in the window of Little Joe's Stereo & TV. Booster's date with Staci (to meet the governor, no less) is interrupted when Broderick shoots at him across the street from his B.G.I. headquarters. Wearing only his Legion Flight Ring and a handmade tuxedo, Booster battles Broderick. Booster sets up a distraction for the robbers using a bottle of Teroux Champagne. This is likely a cheap champagne, maybe even a masquerading sparkling wine, as Booster is unlikely to waste a truly fine champagne on liquor store thieves. Boosterrific Review: Booster Gold #18 is largely a character study of Booster Gold from the point of view of the issue's antagonist: the federal agent Broderick last seen in issue 15. The middle third of this book is essentially Broderick's story, giving the impression that Broderick was intended to be a bigger player in the life of Booster Gold than he already was. Even if that wasn't the case, it's an interesting opportunity to show how Booster Gold affected the lives of people even before becoming a super hero. The primary appeal of this issue is the portrayal of Booster Gold as a moral and intelligent hero. Despite Broderick's reservations to the contrary, in this issue Booster demonstrates humanity far beyond that which he is typically credited as he puts his life on the line to thwart an unglamorous liquor store robbery. And while the case could be made that Booster is simply manipulating the situation to save himself from Broderick's bloodlust, even that pays complement to Booster's often underplayed intelligence. Either case is a win for Booster, and this issue is a win for the reader. I really enjoyed this story a lot. Broderick turned out to be a very interesting character; I really hadn't expected to see him ever again after Booster returned from the future a few issues back. Great issue-I would say the finest in the first series. The contrasting lives but intertwined stories of Broderick and Booster is wonderful.